This is a photograph of Johann Jakob and Fredricka Schwarz's family, front row (left to right): Fredricka Schwarz (mother), Johann Jakob Schwarz (father), Sophia Schwarz (Sophie), Katharina Fredrike Schwartz (Kate) and back row (left to right) Anna Marie Schwarz (Mary), Jacob (Jake) Schwarz, Elizabeth Emilie Schwartz (Lizzie), Gottlieb Schwarz, Caroline Schwarz (Carrie), and Ernestine Pauline Schwartz (Pauline). 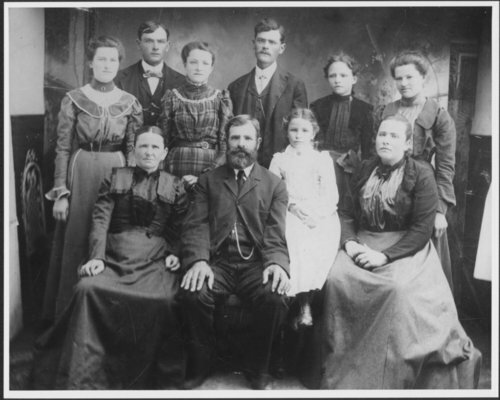 Katharina, Gottlieb, Jacob, and Pauline emigrated from Germany to America in March, 1887 with their father Johann Jakob Schwarz, settling in the vicinity of Burns, Kansas. Fredricka Schwartz came to America with daughter Mary (then 4 years old) and baby Elizabeth later in 1887. Unusual for the time and place, and strict German custom, Jakob Schwartz wanted his girls to learn a trade or profession so they would support themselves. Pauline became a nurse, Elizabeth a milliner, Carrie and Sophie teachers, and Mary became a piano teacher and was the pianist for the Methodist Church in Burns, Kansas.